We have a lot of options for base cabinets, in fact, just about anything you dream up can be done! Here are a few of the more popular options. Do keep in mind that we only use a high grade of hardware, to ensure quiet, smooth operation for years to come. It is VERY important to us to make sure our customers are COMPLETELY satisfied with the function and interior of the cabinet as well as the exterior. Small Single Waste Receptacle - Our waste receptacles are alumunimum slides with soft close and polymer containers. Wood Lazy Susans - These susans are very sturdy, smooth, and quiet, and look good too! The options and configurations are simply endless... just tell us what you like and don't like, and we'll design your project, whether it's a kitchen, bar, entertainment center, bookcase, or what ever, around your needs and wishes! 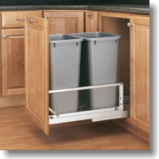 Large Double Waste Receptacle - Our waste receptacles are availble in several configurations and styles. 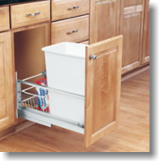 Blind Corner Pullout - Try a blind corner pullout for easy access to hard-to-reach places. Wood Susan w/ Metal Vine Rail - For something even more attractive, or perhaps in an open corner, try a wood susan with a metal rail. 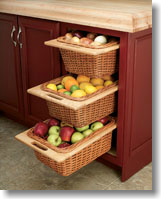 Base Pantry Pullout - Need more storage? How about a base pantry pullout? Great for smaller base cabinets. Wicker Baskets - What size of wicker basket fits your design? Acrylic Flatware Organizer - a customized acrylic organizer, it's your call. Adjustable Spice Rack - These acrylice adjustable spice racks fit on the backs of doors or anywhere you need them.